SAM SCHUERMAN: Nails of the Week: Blue & Turqouise! I'm trying to make it a routine of doing my nails every Friday night..... whether or not ill be able to keep that up I don't know but it's nice to have my nails done :) nothing better than looking down at your hands and having a little bit of color on them! 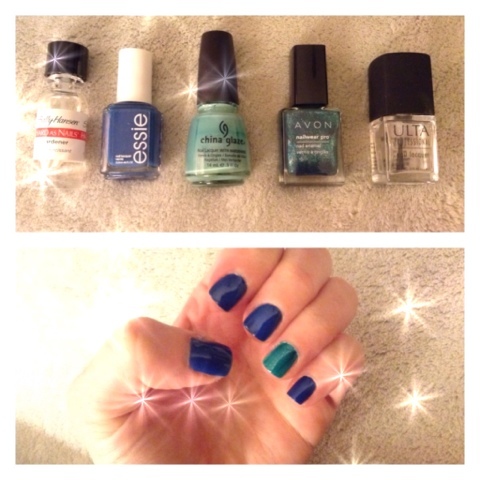 This week I chose Essie "Mesmerized" with China Glaze "For Audrey" on the ring fingers with Avon "Sequined Turqouise" over the top. The Essie color is seriously amazing. A dream to apply.... You could probably get away with one coat as it goes on so smooth with barely any streaking. It just kind of melts onto the nail like butter. LOVE IT! Plus it's the perfect soft navy blue.